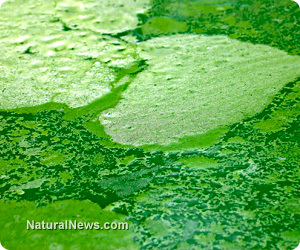 (NaturalNews) Next time you notice green slime growing in a pool or pond, take a second look. Incredibly, that bit of algae could be the secret to solving our war related financial difficulties and environmental troubles. As an incredible source of alternative energy, algae is used in a variety of innovative ways. Two outstanding examples include an office building utilizing a bioadaptive facade to produce energy as well as an American company that employs the power behind this tiny organism to manufacture biofuel. Warfare in Afghanistan and Iraq has created staggering debt for the American people with estimates reaching close to $4 trillion. While some believe the Afghan war was in response to the September 11 attacks, many suspect it's the result of a proposed central Asia oil pipeline which would travel through the country. And most don't doubt the war in Iraq was waged in the name of oil as well. A hefty price is paid for this 'black gold.' With these two wars alone, over 224,000 people have died directly because of the violence and many more indirectly due to the destruction of clean drinking water, healthcare and nutrition. Financial and human losses are not the only consequence of petroleum addiction -- the environment is in serious jeopardy too. Between global warming and pollution of the air, soil and water, oil is a dirty business. Creating tremendous amounts of CO2 while contaminating the environment with heavy metals and sulfur, burning any kind of fossil fuel puts an enormous strain on nature and our physical health. Not to mention the byproducts of oil refining that destroy surrounding ecosystems -- threatening animals, insects and humans alike. Intelligent and responsible solutions are desperately needed. Surprisingly, algae may be the answer. Slated to open in March 2013 in Germany, the world's first algae powered building is a game changer for green design. Utilizing bioreactive louvers filled with micro-algae, the facade of the structure traps heat from the sun which is then used as a power source. It also provides cooling shade when outside temperatures rise. Additionally, the algae is harvested as biomass, providing yet another source of energy. The technology is estimated to generate 10 percent of the building's electrical demands without harmful pollution or waste. But algae is put to good use in other forms of green technology as well. Enter fledgling companies like Sapphire Energy who turn four basic elements (algae, CO2, water and sunlight) into 'green crude oil.' As of 2012, the company has the world's largest algae farm on 300 acres of New Mexican desert scrub. The goal is to produce around 100 barrels of oil a day, equating to 1.5 million gallons a year. The major stumbling block is cost -- between $240-$332 a barrel, far higher that standard petroleum. Be that as it may, if we compare the expense of American wars over the last decade, the cost of manufacturing this green petrol is a true bargain. Cynthia Warner, CEO of Sapphire, believes it can change the world by allowing any country to manufacture its own petroleum while significantly reducing carbon dioxide emissions. "This technology is so compelling - and it will make such a big difference - that, once it gets out of the gate, it will ramp up very quickly," she said.